One of the exhibitions I'm most excited about this month is at what I'm now calling G5 (that's Gallery 500 to you). Dan Gilsdorf takes the bull by the horns with Interstate, an exhibition of kinetic sculptures and installation. 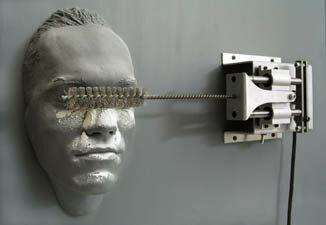 Gilsdorf himself calls it “mechanical simulacra as homage to human consciousness”. This body of work embodies rich conceptual ideas exploring masculinity, industrialization, militarization and entropy while conveying the enchantment of mechanized animation. The repetitive and destructive nature of the automata is both fascinating and disturbing. You'll want to catch this exhibition early in the month before it meets its own demise. At Motel, Jessie Rose Vala and Emily Counts unveil their mixed-media installation, The Future Remnants of Dreamvilles. In this ambitious exhibition Vala and Counts create a Victoriana living space, complete with hand-silkscreened wallpaper, custom upholstery, organza boughs and extensive collections of new drawings hung on the walls. Enter a world of wilderness, refinement, danger and mystery in the transformed gallery space. Local independent press emporium Reading Frenzy presents international art-stars Chris Johanson & Jo Jackson with Casual - Imagistic, a cacophony of posters, editions, video, ephemera, books and more. These Portland-based artists explode their archives onto the bookstore walls with some unseen and unconventional pieces for (purportedly) affordable prices. Not to be missed. Opening Reception • Aug 4th • 6 to 8p? The Everett Station Lofts host their annual Rooftop party. Also, at Compound, SUPERHERO group show featuring artists from around the globe. In one of the more politically charged exhibitions of the month, Kenny Higdon presents Questions for the Christian, a collection of paintings and sculpture. Higdon, whose conceptual work flirts with the darker side of social history, was last seen at Lovelake with the Misadventures of Lewis and Clark. Portland Modern delivers its latest installment from Issue No.2 at Gallery 114 with the work of Troy Briggs and Amanda Ryan. Ryan is a Portland native who creates rich abstractions. Briggs' work is more subdued, with distorted figure drawings conveying a sentiment of "elegant sadness". In what may be the last event in their 12th Avenue space, Pulliam Deffenbaugh houses a "best of" Summer Group Show featuring their represented artists. New works by Brian Borrello, the recently departed (for L.A.) James Boulton, Brenden Clenaghen, Anna Fidler, Ken Kelly, Jeffry Mitchell and many more. Mel Katz has been a Portland staple for the past 42 years. He held his studio across the street from Motel for much of this time and until he relocated last summer, would drop by regularly to tell me I was either crazy or brilliant for opening an emerging artist gallery. His influence on the city as an artist, teacher, mentor and activator has been sizeable. This week you can catch the kind-hearted curmudgeon at Laura Russo with his freestanding aluminum sculptures. Exploring the interplay of positive and negative space, his colorful and often humorous pieces may seem dated to some but speak to the artist's own aesthetic integrity and historical context. Also showing are Jun Kaneko and Manuel Izquierdo.